This pie is cool and refreshing and sweet with a little tang. Inspiration for this pie came from Healthy Indulgences Key Lime Pie. Oh it’s so good and velvety! Hop over there and make it! Amazing! I’ll confess that I had key lime cheesecake from Cheesecake Factory this past weekend. Healthy Indulgence’s is way better than Cheesecake Factory, hands down! Since doing Trim Healthy Mama I’ve fallen in love with all things lemon. Strawberry Lemon Pudding is a new favorite so I got to thinking of how I could make a strawberry lemon pie. 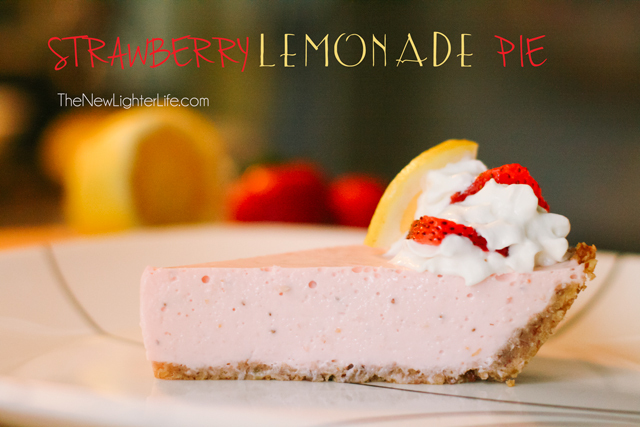 Like I said, I love the key lime pie from Healthy Indulgences so I tweaked their recipe and came up with my perfect version of a strawberry lemonade pie. I use an immersion blender to blend my strawberries throughout, you can also use a regular blender. Also, adjust the sweet according to your personal preferences. Here is my very own Strawberry Lemonade Pie. Preheat oven to 350 degrees. Mix together all of your crust ingredients and press the dough into a lightly greased pie plate. Bake crust for 10 minutes. Remove crust from the oven once edges are slightly browned. Place dish on a cooling rack to cool, refrigerate or freeze the crust too cool if you are in a hurry like I am. Set cream cheese out on the counter for 2 hours to reach room temperature. Beat cream cheese with a mixer until smooth and free of lumps. Stir the xylitol and stevia into cream cheese, then beat with mixer until the texture is smooth. Heat lemon juice, covered, in microwave on HIGH for 2 minutes. Add zest zest to hot juice. Whisk gelatin into the juice until completely dissolved. With an immersion blender (or regular blender) blend in 2 cups of chopped strawberries. Let cool until mixture is no longer hot to touch. Stir strawberry-juice mixture into cream cheese. Blend throughly. In a separate bowl, whip the whipping cream until stiff peaks form. Gently fold the whipped cream into the cream cheese/lemon juice mixture. Stir until fairly even. Refrigerate pie uncovered for 3 – 4 hours. Serve with a dollop of xylitol sweetened whipped cream and vanilla or Reddi Whip and strawberries. Pie will keep at least 3 days refrigerated. This recipe has been linked up at Stacy Makes Cents and Gwen’s Nest for Trim and Healthy Tuesdays. This looks delicious! That key lime pie has been enjoyed by our family several times this summer. Love this idea! Oh my gosh – this looks GREAT! I kept thinking: “How did she get her pudding so thick?” Cream cheese! DUH! 🙂 Thanks for linking at Trim Healthy Tuesday! You’re welcome! I hope you like it as much as we do! This looks fantastic! I have granulated xylitol, should I powder it then measure the given amounts? Or measure the xylitol then grind it to powder? I would grind first and then measure. Enjoy! I just made this today….and Oh My Yummy!! Thank you so much!! This is my new summer favorite!! Yay! So glad you like fit. It is one of my favorites!